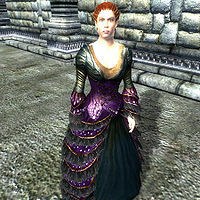 Anya Herrick, a Breton noble, is a servant to Lady Syl who lives in New Sheoth Palace. Like Syl, she is also very concerned about safety and is in a constant state of fear. During The Lady of Paranoia quest, you will have to unmask her as one of the conspirators plotting against Lady Syl. She lives a rather monotonous life centered on her role as servant of the Duchess. She wakes up early at 6am to enjoy a two hour breakfast, which is the only meal she eats, while sat in her room in the House of Dementia. She will then make for the throne room, where she will sit down in one of the chairs and will remain available until 2pm. For the next four hours she enjoys a refreshing stroll in the palace gardens, before returning inside the House of Dementia, where she spends another six hours wandering around. At midnight, she retires to her chambers and goes straight to sleep. This routine suffers from a few changes during her related quests. Due to Syl's increasing paranoia, during the first related quest, she will be found outdoors from 8am to 6pm. If you secure her help during the Ritual of Dementia quest she will immediately rush to the Dementia gardens in order to distract the guards. Finally, during the End of Order quest she will remain indoors at all times. She wears an elegant purple finery and is armed with a fine steel dagger. When she greets you, she'll say "I'm Anya Herrick. I serve Lady Syl, and she allows me to remain protected within the House of Dementia. I'm so grateful to her." On subsequent meeting she will reveal her nervous nature: "Here we are, safe indoors. Nothing to harm us here, is there?" During the Lady of Paranoia quest, two inhabitants of New Sheoth will tell you she has arisen suspicion because of her behavior. If you let Herdir torture Kithlan he will break down and admit: "All right, all right... please, just stop. I don't know anything specific, but Anya has been looking scared lately. More scared than usual. I think something's going on with her. Now please, leave me alone!" If you instead raise Kithlan's disposition above 80 he will tell you: "I don't know anything about a conspiracy, but Anya has been looking extra nervous lately. She might know something more than I do." Another choice is Ushnar gro-Shadborgob, who will also crack under torture: "No more, no more! All I know is that word has gotten around about Anya Herrick. She looks more nervous than normal lately. People think she might be up to something!" Haskill will also you give you a tip on how to approach her: "Keep in mind that Anya is cowardly, and may require persuasion to tell you what she knows." Indeed, while she will initially deny being involved, saying "What? N...No. I don't know anything about anything. I'm sorry, I can't help you. ", a bit of torture will open her lips: "Please. I am not involved... I didn't do anything! They wanted me to get them close to Syl, but I wouldn't abide them!" She will then expand: "I... I don't know, not for sure. Ma'zaddha came to me, said that Syl needed to be removed, and that I was supposed to help them, or else. I would be far too afraid to turn on Syl. But I couldn't turn them in, either, because they might come after me. Please, you must do something!" When asked more about Ma'zaddha she will reveal: "It was Ma'zaddha. He said he was working on behalf of someone else. He told me I needed to help him, or there would be repercussions. I didn't know what to do. Turning on Syl could cost me my life, but if I don't help, what will Ma'zaddha do to me? You must do something!" When asked about the conspiracy again she will repeat: "I've told you all I know. It was Ma'zaddha... I don't know anything more, I swear it!" During the Ritual of Dementia quest, the denizens of New Sheoth will inform you of Anya's loyalty: "Shhh. The walls have ears! I hear that in light of recent events at the palace, Anya Herrick is more loyal to Syl than ever. In fact, she rarely leaves her side!" When you get close the Anya, she will now greet you with "I bid you welcome." and be surprisingly happy to see you: "Ahhh, good to see you again." If you question her about the Duchess with a too low disposition she will just say: "Ha! You're mad! Syl has yet to be bested in any combat! Unless... well, if you think you have a chance. How do I know this isn't some sort of trick?" With her disposition raised above 60 she will inform you: "She is staying well out of sight. No need to take unnecessary risks. I maintain a close watch on her. She fears that Sheogorath no longer favors her presence and wants her replaced." For all her supposed loyalty, if you inform her of your murderous task and raise her disposition above 60, she will betray Syl without thinking about it twice: "Perhaps I've misjudged you. Alright. I'll help. Just remember me when you take over her position. What can I do to help you?" Once you tell her of your plans she will agree to aid you: "Well, the best I can offer is help with the guards. I can distract at least two of them and get them to leave her wing of the palace. That should help you to get in there a bit easier." She will then set off at a running pace towards Syl's Quarters, doing her best to distract the guards; if you manage to let the Dark Seducer guards detect you, she will angrily comment: "Fool! Did you wish to have us both put to death?" If you talk to her, she will reject you with: "What do you want now? I told you what I'm willing to do... now get away from me before someone hears us." After you have discovered Syl's body she will once again call you a fool and return to her regular duties. Later on, when Syl has been slain in the depths of Xirethard it is possible to speak with Anya before talking Syl's Heart. She will be quite surprised to see you: "Do my eyes decieve [sic] me? You live?" and say: "So, the cycle begins anew and the Dutchess of Dementia has fallen. Just remember it was I that assisted you. I expect that will carry some favor under your rule." After you have claimed the heart, regardless of you have visited the Sacellum or not, she will welcome you to the House of Dementia: "Dark days, my lord/lady." and "I will serve you well, Lord." She will bid you farewell with a warning: "Don't forget who your friends are, or they may just become your enemy." While Kithlan will be most helpful during Addiction, Anya will, when asked about the Chalice of Reversal, reveal that she really does not care for Thadon: "Thadon's problem. Not mine." Also, if you visit her after completing the Main Quest, she will greet you in an entirely different way: "Good day, Your Grace. ", "What is it you require, my lord/lady?" and a rather odd farewell: "Take heed the knife that strikes from behind." Someone new in the Isles? Oh no, I don't want that. Perhaps Syl will put a stop to it. The Gatekeeper, dead! This could be the end for all of us! Hearing that the Resonator works again almost makes up for losing the Gatekeeper. We're still not safe, though. If Thadon has his Chalice back, maybe that will smooth things over between the two Houses. I don't know what happened. I didn't do anything to Syl, so why was I punished? The Great Torch is lit once more. Maybe we might be safe here after all. Crucible has a new ruler. Perhaps I can continue to find shelter in the House of Dementia, else what will I do? Thank Sheogorath it was Thadon who was killed, not Syl. The Fringe gone. We're next. I'm sure of it. The Gatekeeper has been rebuilt, which means the Realm is a little safer for now. The realm has regained an army. Let's hope it can protect us. Maybe there really is no place left to hide. We are truly doomed if the attempts to find Him fail. The Greymarch is over. At least I'll be able to sleep a little safer now.